Are you seeing various advertisements? Do you want to find out the program responsible for this? You should know that Webfuii might be the program causing you inconvenience. This application works on Internet Explorer, Google Chrome, and Mozilla Firefox. It might get onto your computer if you download it from its official website webfuii.com or it might get on your system bundled with various additional applications. We neither recommend keeping Webfuii nor all those unfamiliar programs onto your PC. If you decide to remove them from your system once and for all, you can use the removal instructions that you will find below the article. 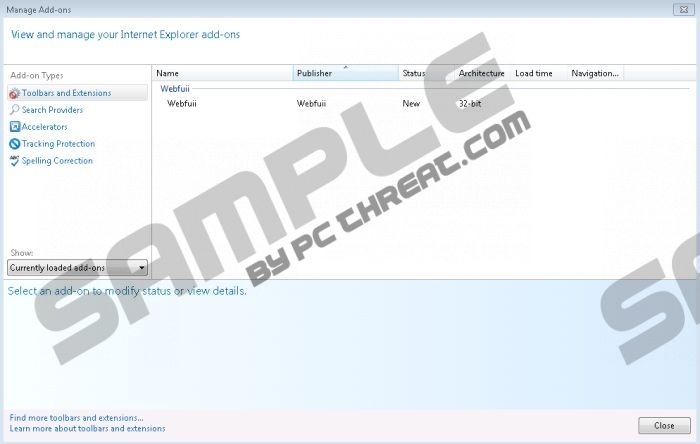 If you have downloaded Webfuii from an unreliable website, it is very probable that you have installed various free programs that came bundled with it. It is better to remove all the unnecessary software because these programs might slow down your computer and even force you to experience some inconvenience. What is more, Webfuii is going to collect some of the information related to your browsing habits after the installation. According to its publishers, this data is gathered in order to improve this browser plugin. However, we believe that much of the information about you might be extracted from this data. If you want to prevent this from happening, you should definitely erase Webfuii from your system. Advertisements themselves are not evil; however, if you keep clicking on them, you might be exposed to malicious software. Every time you click on the ad, you will be redirected to the website whose content is unknown. As nobody monitors what they place on those web pages, cyber criminals might use them for unfair purposes. It is impossible to find out if you are going to be taken to reliable or unreliable web pages, which means that the possibility to come across different threats is rather high. It is actually better to erase Webfuii, if you want to keep your system protected from various unwanted applications. You can do this manually or automatically, depending on your wishes or experience. The instructions for manual removal can be found below; however, you will need to acquire a reliable antimalware tool like SpyHunter if you decide to erase Webfuii automatically. If you upgrade the malware remover, it will protect your system from threats in the future as well. Access the Metro UI menu (click the Windows key). Move the pointer to the lower-right corner of the screen. Type in “Control Panel” into the search box. Click OK and go to Control Panel. Quick & tested solution for Webfuii removal.